And the more we fight, the more we don't get right. 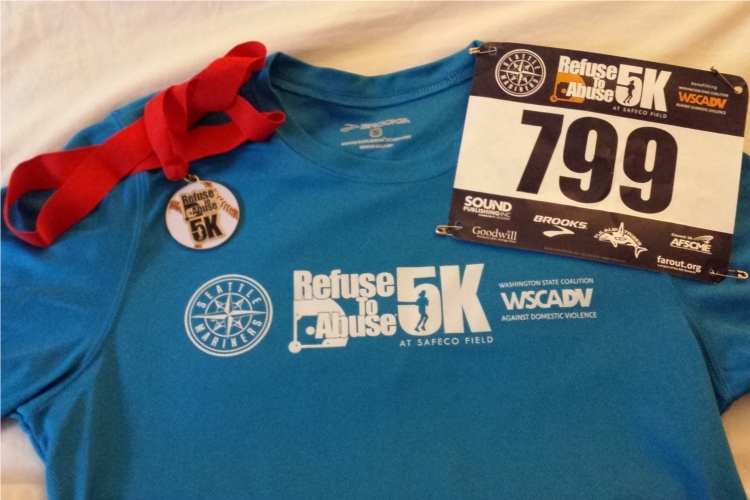 Race Day: Refuse to Abuse 5K at Safeco Field! 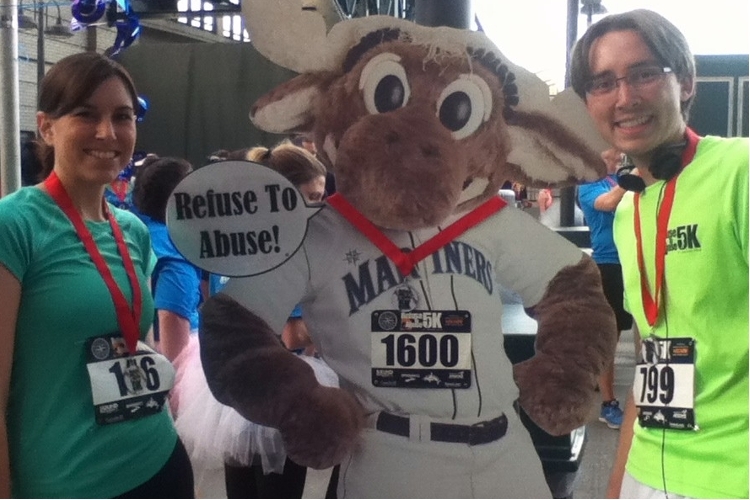 Today I went and ran around inside/on Safeco Field for the third annual Refuse to Abuse 5K that’s hosted by the Mariners and the Washington State Coalition Against Domestic Violence. Stephanie and I ran in this race last year, too; it’s a lot of fun. Unfortunately, Stephanie has been dealing with a wonky left ankle for the past few weeks, so she didn’t run, but she still went down and walked the course. 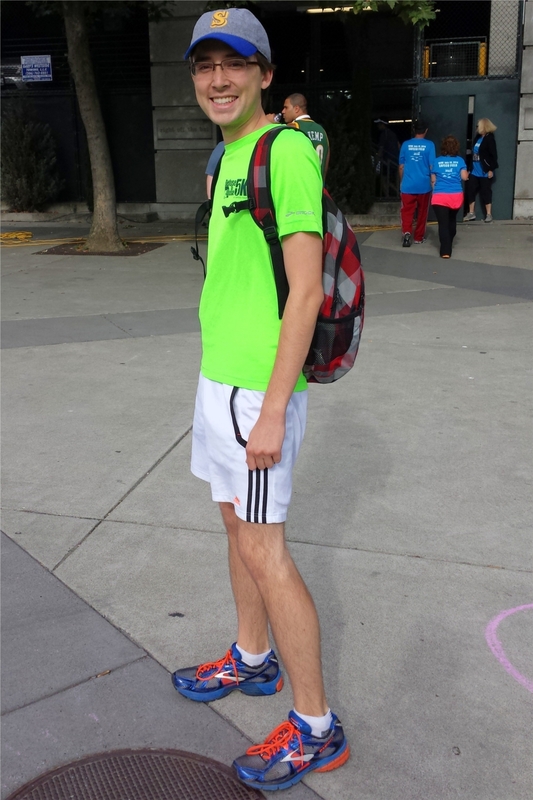 Decked out in my finest neon. 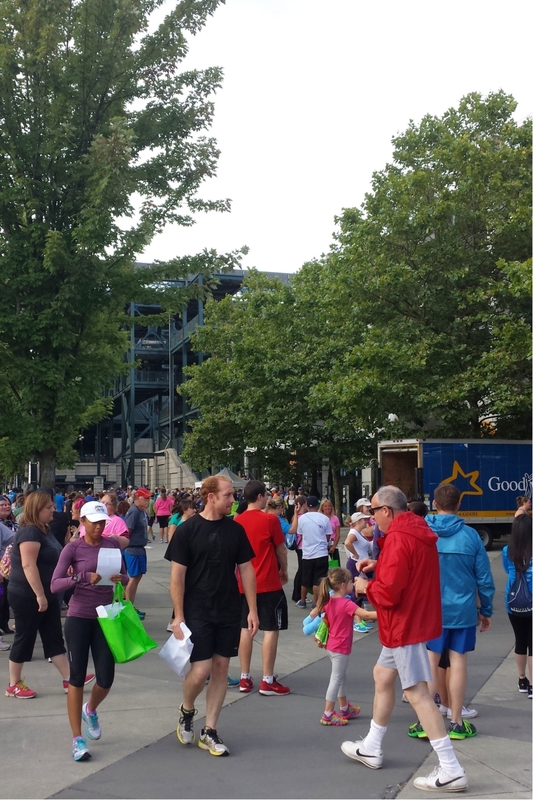 There were more than 1,300 runners/walkers and many more spectators. Before the race, a bunch of pop music was being played (blasted) to help people get “pumped up”. Starbucks also had a booth where you could grab some water or a cup of their lukewarm Passion tea (blech). There were also a few activities for the “kids”. A station was set up with a bunch of markers and construction paper, where you could make encouraging signs to cheer people on. There was also a speed pitch booth, and the Mariner Moose was going around giving hugs and high-fives. 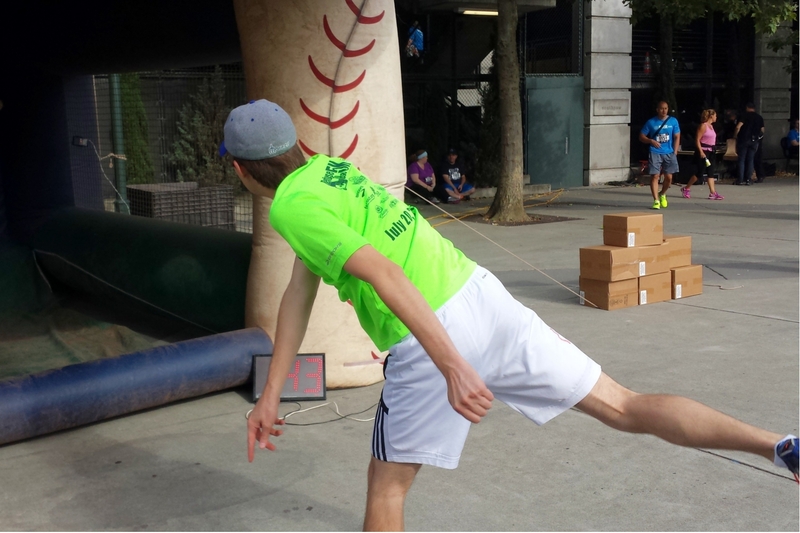 Throwing a squishy, Nerf baseball a whopping 43 miles per hour. I’m a regular Jamie Moyer. This year, the race was held a little later in the evening (@ 7pm) so it wasn’t as hot/sunny, which was nice. Unfortunately, it was way more humid. Blergh. Also, because there were more runners this year, they implemented a staggered start, releasing waves of ~100 people every 30 seconds, so I only got stuck behind slow pokes a few times. I hadn’t been training very well the last few weeks because I’ve been sick and it’ s been SO HOT, so I ended up running pretty slowly; my time wasn’t great, but it was still fun. Posing with a 2-D Mariners Moose after finishing the race (image quality courtesy of Stephanie’s iPod). After the race, we returned home, showered, changed, and went to a new wood-fired pizza restaurant just down the road. It just opened last month and we wanted to check it out. I got a small Caesar salad (which had a deliciously tangy dressing, but didn’t come with croutons?? ); a happy hour, personal pepperoni pizza (meat #34); and a pint of some local American amber. We were also able to catch the end of the Mariners game, and watch them beat the Angels in extra innings. Woo! Speaking of the Mariners… I’ve recently been given the opportunity start writing for Lookout Landing, the SBNation blog that covers the M’s. Earlier this week, they posted that they were looking to add an additional writer; I thought that that sounded really neat, so I sent them some writing samples and a resume, and they offered me a job on Wednesday. 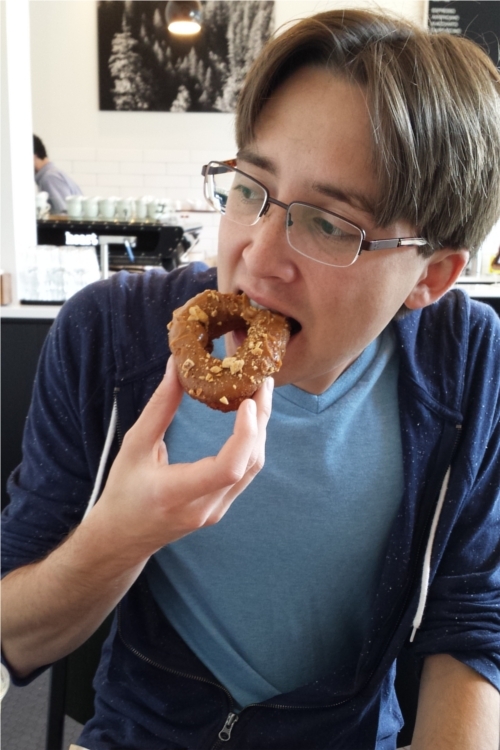 My first post went up yesterday morning and it was received pretty well. Also, Lookout Landing is currently the most popular blog among all of the baseball blogs on SBNation (I think it averages ~25,000-30,000 site views a day), so having the chance to write for them is not not a big deal. I’m excited!